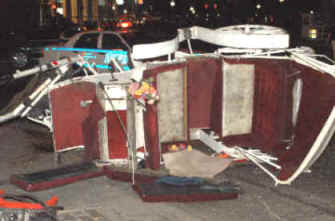 Horse drawn carriages constitute a danger to people in vehicles, on bicycles, and on foot. They impede the flow of traffic, particularly with respect to emergency vehicles. The horses are forced to work in dangerous, unhealthy and unnatural conditions. Major cities such as London, Paris and Toronto have all banned horse drawn carriages. It is time for other areas where these industries currently exist (such as New York City) to move into the 21st century and take seriously its moral and ethical responsibility to these sentient beings while ensuring the safety of its citizens. Surely as a civilized society, we must do no less. Accidents - An archive of articles documenting horse drawn carriage accidents and stable fires. Articles - An archive of articles documenting horse drawn carriage industries, carriage accidents, and related information. What Happens To Horses Who are No Longer Able To Work? What Will Happen to the Horses if There Is a Ban? Coalition to Ban Horse-Drawn Carriages.